With real, noticeable results, no surgery or recovery time, there are so many reasons why BOTOX Cosmetic has been chosen by millions of men, women, and doctors as the go to age-defying solution. BOTOX® Cosmetic is a prescription medicine that can be injected directly into the facial muscles to remove wrinkles and temporarily improve the look of moderate to severe wrinkle lines and dimples. For example, BOTOX® Cosmetic is used quite regularly for people ages 18-65, to reduce frown lines between the brows. 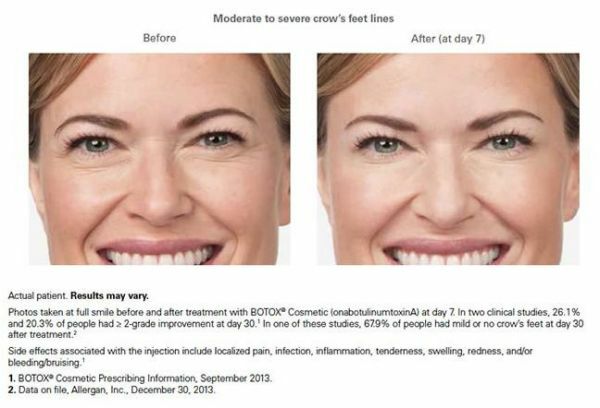 BOTOX® injections can also be used to improve the look of lines on the forehead, to reduce crow’s feet, and to rid the face of any tired, angry or unapproachable “expressions”. This process is a simple, non-surgical injection that goes directly into the muscles and works by blocking nerve impulses to the injected muscles. This nerve blockage results in the reduction of muscle activity that would normally create these moderate to severe lines to form. This injection effectively prevents the muscle’s ability to form any lines temporarily. Northshore Dermatology is also proud to announce, that we are the only Diamond provider of Botox, Juvederm, Voluma, Latisse and SkinMedica skin care products on the Northshore! BOTOX® Cosmetic is certainly not just for women either. If you are a man and think it’s time to do something about those moderate to severe facial lines and wrinkles, it is worth it to talk with us about whether or not BOTOX® Cosmetic is a good option for you.